Fujii's sales staff visited to Malaysia to demonstrate and tell technical guidance for MB1021XE1 and MC915XE. 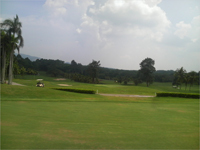 Malaysia belongs to a tropical climate. The highest temperature in the daytime rises to 30-35 degrees Celsius and a squall falls every evening. Therefore grass suddenly grows up. I demonstrated the machine at the place of a perfect condition to cut grass. The distributor had a good impression for the machines. In particular, they seemed to be satisfied with the climbing ability and power to be able to cut a thicket for MB1021XE1 and "ZERO TURN" for MC915XE. In future, we want to expand sale to Southeast Asia. "The engine is so powerful. I can mow everyplace! " The owner of Hukada farm, new user, said,"I never hartd the name of" Fujii corporation", but the dealer recommended Fujii's mower. So, I decided it." ME1018X1is Fujii's standard model, and easy- to-use. The mower's tough body and smooth HST make the owner satisfied. In this farm, ME1017X1 is used to mow underbrush. Mr.Fujimaki had used 14HP, but he renewed with ME1017X1(17HP). ME1017X1 is high class model with massive equipments. 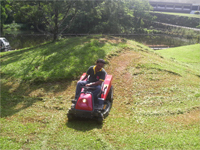 He said"This machine has more power to mow easily and speedily and ability to turn in a small radius. Outside is made of steel, so it' s stout." He realized the selling points of ME1017X1. The most remarkable point of this machine is taking decks off. It makes much more easily to changekives. 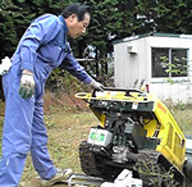 "My favorite is faster working speed"
Mr.Miura has used the mower for 4, 5 years. 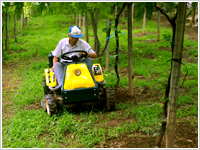 He uses the mower at grape vineyard mainly, and his favorite point is faster working speed. "A few days ago, I mowed the grass like human height at fallow field" he said. He utilizes functions of the mower fully. In his neighborhoods, Fujii has a good name and is trusted, so there are many Fujii's riding mower users. "It takes only 10min. to finish daylong mowing. " President Yoshida, Yoshida Tatami mat shop, purchased Fujii's riding mower for a fallow field, owened by his relative. "It took all-day to mow at the field, and I changed mower cutter many times. But it takes only 10 min. with this mower!!" "We made great buy. He will mow all-day on his day off. "His wife said. She is happy for him to use the mower comfortably. "I really enjoy riding on this machine." Mr. Fumihiro Suzuki runs a pear farm in Fuji City, Shizuoka Prefecture. He bought a riding mower for the first time a year ago. "I really enjoy riding on this machine. A friend of mine who bought Fujii's riding mower at the same time also enjoys riding it. ", he said. He seems to be happy with it. "Maybe because I use herbicide less often, earthworms have increased in the last one year. "He was also surprised at the change in the soil quality. Mr. Suzuki's pears are 100% sold direct to individual customers through home delivery. He has many repeat customers. We hope he can harvest tasty pears this year also. "The work speed has gone up. I can mow comfortably without raising the rpm of the engine. " Two weeks have passed since Mr. Toshihisa Amemiya bought a new mower. "I used to have a small riding mower, but as I replaced it with MB1021X1, the work speed has gone up. Now I can mow comfortably without raising the rpm of the engine." He seems to have realized how efficient the high power engine is. The town where he lives is famous as a peach growing district. Mr. Amemiya's farm is large and grows many different kinds of peaches. Sweet and tasty peaches can be harvested for as long as three months from July to September. Mr. Amemiya is still young and seems very particular about the way of mowing. We must be able to enjoy the highly-reputed peaches from his farm this year also. Mr. Noboru Nakajima, president of Chuhatsu Industrial Machine, Ashikaga City, Tochigi Prefecture, is hooked on mowing his own house yard. He uses Fujii's hammer knife mower. 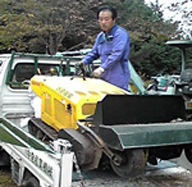 We expect that during the grass growing season this year Mr. Nakajima' s hammer knife mower will move around his house yard even more powerfully. "As the panel can be tilted, you can tell the gradient from the tilting angle." Mr. Yukio Shimoyama lives in Ashikaga City, Tochigi Prefecture. He was the first one to use a slasher in his neighborhood, but now he likes Fujii's hammer mower better than the slasher. "In terms of mowing efficiency, Fujii's hammer knife mower is no match for a slasher, and it can be used in an idle paddy field, on a slope or anywhere you can think of just like a slasher. As the panel can be tilted, you can tell the gradient from the tilting angle. That's very convenient." He admired the hammer knife mower. We recommend that you try using Fujii's hammer knife mower even if you have been using a slasher. "This mower can turn in a small radius and is very powerful. It helps me finish the mowing work quickly. " 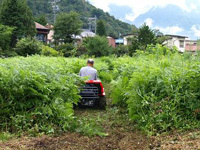 Fujii's riding mower MC915X is currently used in Mr. Kazuo Kamamori's farm in Takayama City, Gifu Prefecture. MX915X is a spin-turn machine able to spin while staying at the same position. 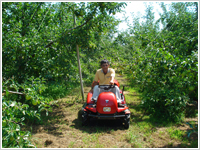 The spin-turn machine is most suitable for mowing the grass around the trunks of the apple trees. Mr. Kamamori, who has been using this machine, is delighted with it. He says, "This mower can turn in a small radius and is very powerful. It helps me finish the mowing work quickly." 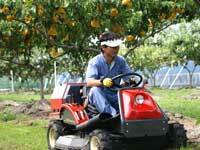 Fujii's riding mower is most recommendable for fruits growers. "I had been using a self-propelled mower, but I replaced it with a riding mower. I am really happy with the new machine. The work efficiency has increased dramatically thanks to this machine." 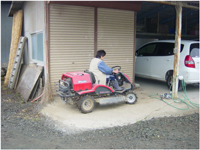 Fujii's riding mower has been used in Mr. Susumu Yamanouchi's farm in Takayama City, Gifu Prefecture. Mr. Yamanouchi grows Showa White Peach. He says he was using a self-propelled mower in the past, but he likes the new machine now. "Since I replaced it with the riding mower, the working efficiency has increased dramatically. I am really happy with the new machine." We hope he will produce many tasty white peaches this year also. We would like to introduce three users of riding mowers in Korea. They use the mowers in their apple farms. All of them unanimously said that Fujii's riding mower is a great help for them. From the maintenance and storage condition, we were able to see that they all handle the machines with care. Fujii's riding mowers have crossed the ocean to operate around the world. Niigata Higashi Minato Plant, Protec Engineering Co., Ltd.
"The machine is in good order and works amazingly fast. So we can mow the grass without a hindrance to our own work. It's a great help." 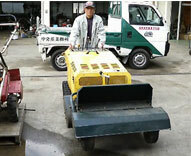 Fujii's spin-turn mower has been used in the outdoor test field of about 10,000 square meters. Mr. Shimizu, manager of the Niigata Higashi Minato Plant, Protec Engineering Co., Ltd. told us with a smile "This machine is in good order and works amazingly fast. So we can mow the grass without a hindrance to our own work. It's a great help." Protec Engineering is a company that studies technologies to control snowslides and landslides, develops and designs appropriate construction methods, perform the construction work and sells associated materials. 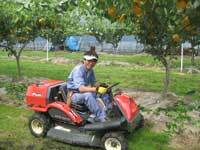 Fujii's mowers are used not only in farms but also in any areas with grass to be mowed. 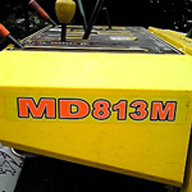 "This machine has a large clearing width, and it is easy to use, convenient and safe. By installing a snow plow, it can also be used as a snowblower in winter. So it plays a double role. " 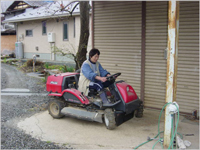 Here, Fujii's riding mower is used to mow the grass around the poultry farm. The user appreciated the machine very much, saying "This machine has a large clearing width, and it is easy to use, convenient and safe. By installing a snow plow, it can also be used as a snowblower in winter. So it plays a double role. " Fujii's riding mower is also at work at the end of summer when grass still grows. "Currently I use a self-propelled hammer mower, but I found the riding mower very easy to use. The sturdy towing hook fitted to the machine must be very convenient and helpful during the harvest season." One summer, a demonstration was conducted in Toyohashi City, Aichi Prefecture at the request of Mr. Hiroshi Kato. Mr. Kato tried using the riding mower and was happy with it. He said, "Currently I use a self-propelled hammer mower, but I found the riding mower very easy to use. The sturdy towing hook fitted to the machine must be very convenient and helpful during the harvest season." "It took one whole day to mow the grass in the past, but now I can finish all alone within half a day. " Mr. Hiroshi Shiratori is an apple farmer in Hirosaki City, Aomori Prefecture. Mr. Shiratori is one of the users of Fujii's riding mowers. Fujii's riding mower operates securely on a slope and it is powerful enough. 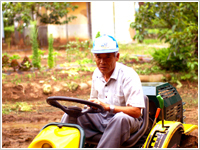 Mr. Shiratori replaced the two self-propelled mowers with a riding mower, and he is very happy with the new machine. He says, "It took one whole day to mow the grass in the past, but now I can finish all alone within half a day. " "It turns in a small radius and is stable and easy to operate even on a slope. It's powerful enough to mow high grass smoothly. " Mr. Tadashi Nagao in Hita City, Oita Prefecture was mowing the grass with Fujii's riding mower for the third time this year. 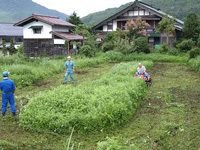 Mr. Nagao, who grows pears, has to mow the grass five or six times a year and he makes a full use of Fujii's riding mower. "It turns in a small radius and is stable and easy to operate even on a slope. It's powerful enough to mow high grass smoothly. " He seemed to be very happy with the machine. We would recommend Mr. Nagao's tasty pears to everyone. "It helps us finish the work quickly and is a great help for us." Mr. Hirofumi Hayashi is a president of Seto Green Management, a contractor engaged in the management of Teradomari Park in Asakita-ku, Hiroshima City. Fujii's riding mower MA1020B is a must for him. Every year, in this season, he makes a full use of the riding mower in the park. He is very happy with the machine and says, "It helps us finish the work quickly and is a great help for us." His company is in charge of green area management of not only Teradomari Park but also other parks and grounds in Hiroshima City and its suburbs. "We find Fujii's riding mower very useful, as it is efficient and works stably even on a slope." Mr. Takashi Hayashi of Joetsu Tourism Development is in charge of managing the lawn between the hotel and the ski ground. He mows the grass on the slope in front of the hotel comfortably with Fujii's riding mower. 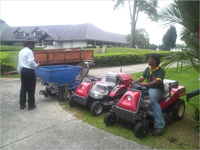 It is a large lawn and has to be always trimmed neatly for the satisfaction of many guests. He seems to be happy with Fujii's riding mower and says, "We find Fujii's riding mower very useful, as it is efficient and works stably even on a slope." We hope that the lawn will always be kept clean and neat in the future also. "I find it very useful in my work as it turns in a small radius." 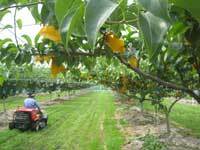 April is the month when mowers have to operate in fruits orchards. 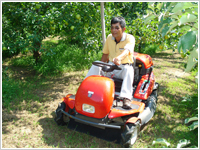 Mr. Kimio Sasaki, a fruits farmer in Yamanashi Prefecture, uses Fujii's riding mower to mow the grass in his vineyard. He is very satisfied with the machine and says "I find it very useful in my work as it turns in a small radius." Since Fujii's riding mower earns a good reputation in his neighborhood, he seems all the more reassured in using it. He showed us a picture of him riding his favorite mower with his grandchild. Mr. Sasaki's Kyoho grapes are sold directly from the farm and are very popular. Meticulous work is being carried out to prepare for this year's harvest as well.